Happy Meal and I had spent a couple of hours at the Peterson Automotive Museum, and lusting after cars, which were well beyond our means, had left us with a gnawing emptiness that only a burger could fill. Johnny Rockets was attached to the museum, so it was a pretty simple choice. Johnny Rockets touted itself as "The Original Hamburger." This left me scratching my head. We had seen some of the "original" automobiles, and I would have much preferred something more recent. We ordered a couple of Rocket Singles with cheese. Our wait was about 15 minutes, and that seemed overly long considering the place was fully staffed and less than 1/3 full. The Beef: The menu proclaimed that the burger patties were 1/3 pound of fresh, never frozen, 100% beef. The beef was most likely plain Chuck, although it lacked the beefiness that most Chuck delivers. The burgers were mild at best. There was no trace of aging or anything else of interest. The beef was dryish, and the patty was not not chewy or oily. The beef was competent but not interesting. The Seasoning: The patties were seasoned...I watched the kitchen apply something from a shaker while the patties were on the griddle. The seasoning was a mild salt and pepper blend, and it did little to enhance the flavor of the burger patties. The Sear: The sear was darn fine at Johnny Rockets. It was dark and even. It was mostly cosmetic, since the beef lacked any real character, which would have been enhanced by a good sear. The Preparation: The 1/3 pound patties were cooked to Well Done on a properly hot flat top. The patties were seasoned as they cooked, and they were only flipped once, which was appropriate. The patties were irregular in shape, so I assumed that they were formed in-house. The Cheese: The Cheddar that topped our burgers was uninteresting to the point of being invisible. I was completely unaware of the cheese on my cheeseburger. The Cheddar was completely pointless on these cheeseburgers. The Bun: The bun was just right. It was an unseeded, plain, fresh, moist, slightly sweet, and slightly yeasty, burger bun. It was beautifully toasted. This lent a satisfying crunch to each bite. 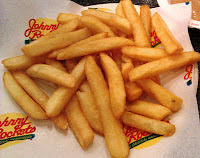 The Fries: The fries at Johnny Rockets were previously frozen and completely bland. They were on the mealy side, and they were under-seasoned. I tried some of Happy Meal's fries, but I went with a salad. The Toppings: My burger came with chunk of Iceberg lettuce from deep in the interior of the head. The lettuce was pale and a little bitter. The tomato slice was fresh, juicy, and ripe. The lettuce in my salad was Romaine, and it was perfect. The Value: The Rocket Single at Johnny Rocket was $7.59, and it came with a side of fries or a salad. The burger was small and bland (average), and the fries were uninteresting. They did offer all the fries that we could eat, but we didn't want to finish the ones that we had. The value was weak but not insulting. 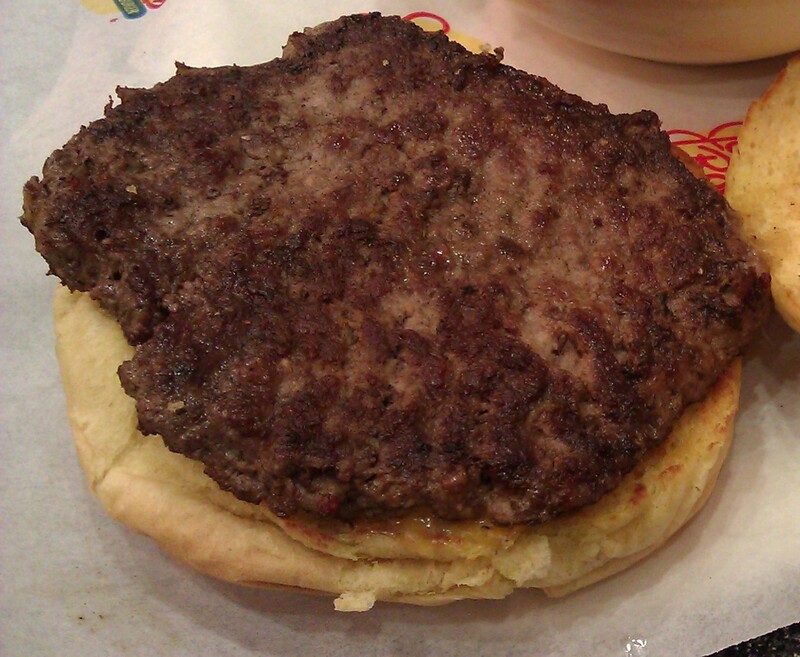 Johnny Rockets served up a slightly over-priced and uninteresting burger. 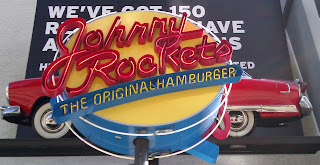 I had tried Johnny Rockets in the past, and I had been unimpressed. That experience was not a fluke. The burgers were on the low side of average. What was confusing was that JNJ Burger Shack used the same blend of beef, and their burgers were mighty fine. Johnny rockets at Kennywood park in west Mifflin, pa is terrible. It's an amusement park yet you can't enter the restaurant until they text you. We had a 45 min. wait and when we got inside, there were at least 6 tables that were totally empty yet people were waiting outside. A girl stands in front of the door with a clipboard. This totally needs someone to oversee this.